Size: Larger trilobite is 7.5 inches long! Here is a HUGE, genuine Cambropallas telesto DOUBLE from the Cambrian of Morocco. This type is one of the most faked or reconstructed trilobites from Morocco. However, there is no mistaking the authenticity of this specimen, as both the part and counterpart are present! These inflated specimens are nicely articulated, extremely inflated, and exhibit fine detail - the broad, sweeping genal spines are clearly defined, and the crescent-shaped eyes are easily seen. 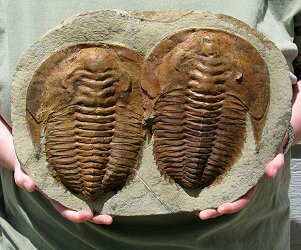 The distinct spines and ridges on the middle lobe on both trilobites are quite evident. The bugs have outstanding, natural coloration and contrast strikingly with the green-grey matrix. The trilobites were so close together when they were fossilized, they are actually touching!. This is a top quality, part/counterpart double specimen of Cambropallas from Morocco - the best we've ever seen.